Lieutenant, 23rd London Regiment att. 2nd/4th Battalion, East Lancashire Regiment. Percy was born in Cold Ash in 1898, the son of Thomas David Quarterman and his wife Maria Ann née Weston. Thomas was a police constable, born in Great Haseby, Oxfordshire, Maria was from Leckhampton, Gloucestershire where they married in 1884. Moving to Berkshire to take up a job with the Berkshire Constabulary, first in Chaddleworth, then Cold Ash and finally in Newbury, they had five children: George Claude, Annie, Cecil, Amy and Percy. All three sons served their country in the Great War, only George survived. Percy was a bright lad educated first at the Council Boy’s School where he won a scholarship to Newbury Grammar School, where he shone both academically and on the sports field; he won an Intermediate County Scholarship and passed the Senior Oxford Local examination. However, he was not to take a place at Oxford University; he joined the Artist’s Rifles Officer Training Corps before he was 17, and gained his commission in January 1916, before he was 18. He was posted to the 23rd London Regiment, and trained at Winchester before being attached to the 2/4th Battalion of the East Lancashire Regiment. At this time the 2/4 East Lancs (a territorial battalion) had been stationed in the UK since 1914, but was now earmarked for foreign service and was being brought up to strength prior to their departure. On 2 March 1917 Percy and the battalion crossed the channel to France, soon they were at the front. On 11 July 1917 he was promoted to Lieutenant (from 2nd Lieutenant), which was promulgated to the world in the London Gazette of 5 November 1917. By the time the announcement was printed, Percy was dead. The 2/4 East Lancs were a part of the 66th Division that, on 9 October was one of three divisions that attacked on the German positions around Poelcapelle, north of Ieper (Ypres). The attack was a failure, the blame often being attributed to the performance of the 66th Division, which had problems getting their men in place in time for the start. It was the Division’s first experience of a large scale offensive (the whole division was as new to the front as the 2/4 East Lancs). However, there was another major cause of the failure; two days before the offensive the skys opened and turned the battlefield into a quagmire, even the artillery was affected as the guns would slide around in the mud when they needed a stable platform in order to be accurate. He fell gallantly leading his platoon in one of the hardest fought battles of the war. He was one of my most promising young officers, and one who I could ill afford to lose. His loss is deeply deplored in the detachment by both officers and men. We had heavy casualties that day. Nevertheless the Battalion covered itself with glory in achieving a well-nigh impossible task. Your son died nobly in doing his share. His brother officers unite with me in tendering you and your family our very deepest sympathy. Many of the dead disappeared into the mud that was to become a notorious feature of the Battle of Passchendaele, which started three days later over much the same ground. Percy’s body was recovered and now lies in plot XIV.B.17 at Tyne Cot Cemetery. 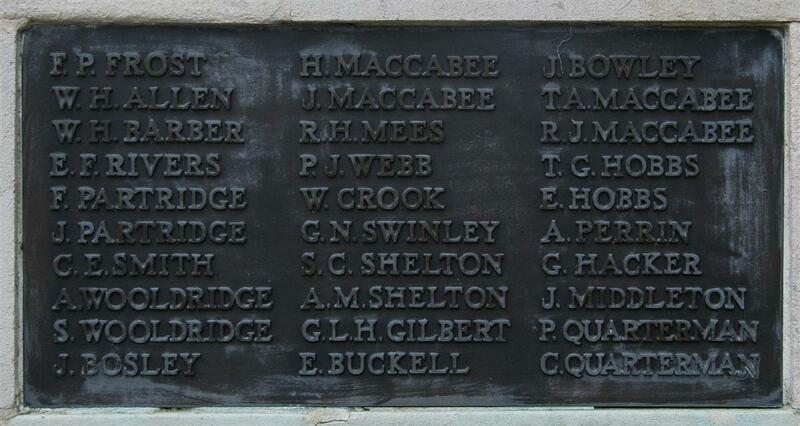 He is remembered on the Newbury Town War Memorial and on a memorial plaque at his old school (then Newbury Grammar School, now St Bartholomew’s School). Second Lieut Percy Harold Quarterman left the NGS at the end of summer term, 1915, and joined the Artists’ Rifles OTC, being then about sixteen-and-an-half years of age. Gaining his commission in January 1916, he was attached to the 23rd London Regiment, and trained at Winchester, being subsequently transferred to the 2/4th East Lancashire Regt. He went abroad in March of this year and at the beginning of October was reported wounded and missing, since when the sad news has been received that he had nobly given his life in the great cause, when barely nineteen years old. Such an untimely end would be too terrible were it not for the unflinching resolve of young and old never to stay their hands until the ideal of freedom which it typifies has been obtained. Becoming a prefect in the summer of 1914, when he left, Quarterman was Librarian, Football Vice-Captain and a prominent member of the Cricket team. He also made a very efficient Secretary of the Scientific Society and instilled much vigour into all his undertakings in the School. PC Quarterman’s eldest son, George, of the 7th Worcestershires, has been invalided with neuritis and sciatica for some time, but has rejoined his regiment in Northumberland. The second son Bombardier Cecil Quarterman, who was wounded in action, is now at Albion House Hospital, Newbury. After the war a tourist industry grew up along the Western Front: relatives of the fallen visited to see their loved ones' grave and to try to get a better appreciation of what they went through. Old soldiers also visited, to pay their respects to dead comrades. Among the visitors were Thomas and Maria Quarterman, who travelled to Belgium on five occasions in order to pay their respects at Percy's grave. The story of Percy's brother, Cecil, is told here.